The OT blessed me on two separate occasions a few weeks ago. (It’s always more exciting when they’re on cable.) I responded by poring over my Visual Dictionaries like I was studying for a final. No, wait. I didn’t study for those. But of course, it’s hard for me to even call the paragon of space odysseys that is Star Wars a “franchise.” Back in the day, it was literally a lifestyle. I spent countless hours sewing costumes for my Barbies, writing fan fiction, and toting my Anakin book bag around school like I was about to Jedi mind trick the entire student body into not teasing me. And it is still hard for pretentious nerd-boys to believe in my devotion – a lack of faith that I quite frankly find disturbing. The Force Awakens reopened the can of prequel worms, spilled them onto the floor, and pushed them back in the dirt with a ten-foot pole before anyone could catch a glance. It tried to make itself immune to criticism by capturing the “OT” aesthetic, while essentially unravelling the perfect bow that the first six movies tied in their entirety. And so the discontent goes. The first six movies complete an Odysseus-style journey. A myth. An epic. Good triumphs over evil, prophecies are fulfilled, and all’s well that ends well. For all the prequel hate out there, they offer a look – albeit at times, a clunky one – into the political climate that gave us the OT. (And let’s be real; The Clone Wars is a gift from divine benevolence.) Maybe George Lucas shouldn’t have tinkered with his “perfect” Frankenstein’s monster of cinematic clichés and ancient storytelling techniques, but the prequels aren’t that bad. 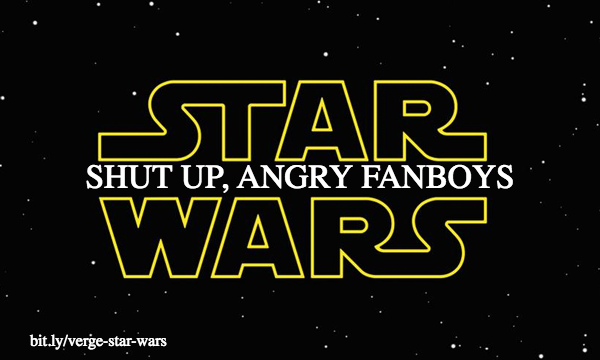 I blame bandwagon hate and the dashed hopes of a fandom bred on 16 years of Expanded Universe content. I don’t like to invoke this sentiment, but if you don’t like it, don’t watch it. We can retreat back into our pre-TFA or pre-prequels bubble, nothing changes. The EU is still canon, but that doesn’t mean I won’t read and enjoy Legends. Star Wars is allowed to exist outside of the timeframe between the Trade Federation’s blockade of Naboo and the Battle of Endor. This is almost precisely the predicament the fandom is in again. The difference is that the newest trilogy moves forward in time, whereas the prequels took us into the past. That’s why the bow was tied so neatly. We knew how it’d end; we just didn’t know how we’d get there. The dissatisfaction (and outright disdain) now stems from the introduction of ambiguity and uncertainty when certain fans didn’t want, need, or ask for either. In many ways, TFA does feel like appropriation of the OT aesthetic without any purpose, but I won’t prematurely judge the whole thing. But the complaint isn’t necessarily about the standalone quality of the trilogy. It’s about the act of untying a tied-up story. In a pop-culture climate of “dark realism,” sometimes it’s nice to have a happy ending – a redemption arc. I hear these disappointments. I feel them like a cinderblock in my gut. But come on, guys! Why so serious? I refuse to ruin an 8-year-old’s fun simply because I’m not happy with the new trilogy because, guess what: that’s what older fans did to me, and that’s why I felt ashamed for so long of my love for the prequels. We were enamoured kids when we first fell in love with Star Wars. We only became pretentious know-it-alls after the fact. What does anyone gain from robbing kids of pure, unadulterated infatuation with something as harmless as the continuation of a cinematic classic? TFA might not have been all we’d hoped it would be. Hell, we might not have even wanted it in the first place, but I was ecstatic just to see those yellow letters scrolling on a big screen – something I hadn’t seen in twelve years. I love – I mean, live and breathe – Star Wars not because it’s something about which I know more than other people but because of the inexplicable joy it brought and continues to bring me every time I watch it (or interact with it in some way). Star Wars may be the last uncynical thing on this godforsaken planet. Let this generation have their trilogy just like we had ours. I don’t like to invoke this sentiment very often, but if you don’t like it, don’t watch it. We can retreat back into our pre-TFA or pre-prequels bubble, and nothing changes. In my mind, the EU is still canon, but that doesn’t mean I won’t read and enjoy Legends. Star Wars is allowed to exist outside of the timeframe between the Trade Federation’s blockade of Naboo and the Battle of Endor. Luke might not be married to Mara Jade and Han and Leia might not be in a stable relationship with three kids in The Last Jedi, but that doesn’t mean the continuation of Star Wars is something to actively dread. I mean, stop using Star Wars as a tool to take away the joy it’s meant to give. Do I sometimes get sceptical and call Disney’s acquisition of Lucasfilm a money-making scheme? Yes. In fact, it definitely is, but on a micro level, people just freakin’ love Star Wars and want it to keep going regardless of whether said meddling irks a certain breed of fan. That won’t stop many people from enjoying it. On a social and political level, this new trilogy is important to the people whom previous two trilogies left behind. Rey, Finn, Ahsoka in The Clone Wars, and so forth. Star Wars isn’t doing as much as it could to be socially conscious, but it’s sure as hell off to a great start. Seeing Rey in Jedi garb on the big screen was an indescribable feeling for someone who used to write fan fiction just so that she could be a female Jedi, and I’m sure it will only be amplified by TLJ. I used all my angst by being a pretentious Star Wars fan (lol) in my adolescence. I’m too old to turn something objectively wholesome and enjoyable into a debate. So, fellow level-10 SW fans, we can have our discussions and disagreements, but remember: it’s a movie series – an earth-shattering, life-altering movie series, but a movie series nonetheless. No matter what is subtracted or added on a macro level, we can still pick and choose the parts we acknowledge on a micro level. We can enjoy the portions we like and still let others enjoy the whole franchise, while also not patronising them.